One of WordPress’ best features is that it’s constantly improving and evolving. Frequent major and minor updates ensure the platform is secure, and provide new and improved functionality. The latest version – WordPress 4.8 – is no exception, so it’s important to update your site as soon as you can. What’s more, it’s just as vital to understand what’s changed and how you can take advantage of the new features. In this article, we’ll introduce you to WordPress 4.8, also referred to as ‘Evans’ in honor of jazz pianist and composer William John ‘Bill’ Evans. We’ll run through this update’s major changes and additions, and show you how to use them. Let’s take a look! Widgets have always been a simple way to customize your WordPress site’s functionality and add important features. The core platform has developed quite the collection over time, including widgets that add calendars, lists of comments or posts, custom menus, and more to your site. WordPress 4.8 expands on the existing offerings by adding three new media widgets. While you previously had to install a plugin if you wanted to easily add media files through widgets, you can now do so without any extra tools. The other two media widgets – the Video widget and the Audio widget – work exactly the same way. All you need to do is add the right kind of file, and it will be displayed on the front end of your site. It’s that simple! WordPress has had a Text widget for a long time. It’s always been a handy way to add some extra text to your sidebar or footer, such as a short bio, disclaimer, or copyright information. However, the existing widget was incredibly simple. It only enabled you to type in a title and content, and didn’t let you customize the appearance of either element easily. This means you can now easily add formatting and links, and view the content of your Text widget through both the Visual and Text editors. You can even incorporate bulleted and numbered lists. This is great news for existing WordPress users who wanted a more useful feature, and newer users who may not have known how to add formatting to the older version of the widget. So far, we’ve covered both new and improved widgets courtesy of WordPress 4.8. This next widget-related addition is a little different, since it will be more of interest to developers than to casual users of the platform. In a nutshell, the three new media widgets we talked about earlier were all created using the Widgets API. All three run using the same base class, which determines how they function. This same class can be used to simplify the creation of new media widgets. That means developers will have an easy time building similar types of widgets, such as ones that add a gallery or playlist to your site. If you’re a developer (or if you’re simply interested in that side of WordPress) there are a few additional behind-the-scenes changes to the platform in this latest update. You can read more about them in the WordPress.org news section. Sometimes, the best updates are the simplest ones. Small changes that improve your everyday workflow can save you time and help your tasks go more smoothly. Such is the case with the WordPress 4.8 update to link functionality. 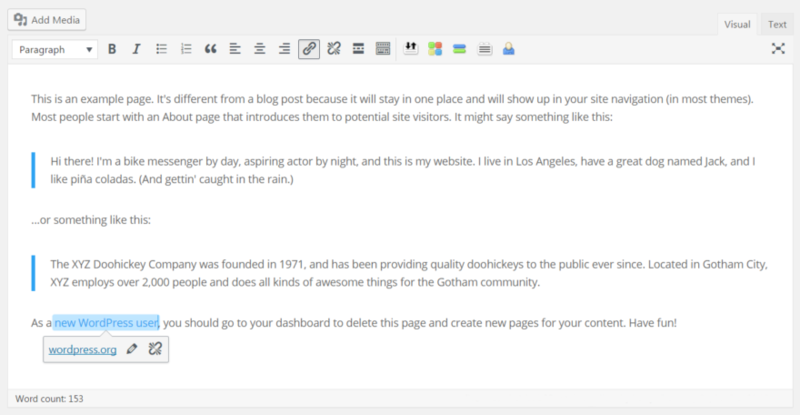 In short, there are now ‘link boundaries’ within the WordPress editor. When you add a link to your page or post, it will have a clearly defined beginning and end point. This means it’s easier to add text either to the link itself, or before and after the link, and avoid accidentally linking the wrong words. Simply type within the box to add text to the link itself. If you want to add text outside the link, place your cursor at one end of the box and hit the left or right arrow key. The highlighting will disappear, and you’ll know you are no longer editing the link. In the long run, this small update should save you some frustration and make the WordPress editor a little more intuitive. The previous four updates have introduced changes to the way you design your site and create content. In contrast, this final addition is meant to help you more easily connect with the larger WordPress community. This back end widget was formerly the WordPress News section, which displayed the latest happenings in the WordPress community. The new version does the same thing, but now also displays a list of WordPress events in your nearby area – including WordCamps and meetups. These events are a perfect way to meet other WordPress developers and enthusiasts, hone your skills, and get more eyes on your own work. With WordPress 4.8, you don’t have to leave your site to find out about these valuable opportunities. As an open-source platform with a huge, supportive community, WordPress is a project that’s always evolving. This is a good thing, because it means developers are constantly adding new features and improving existing functionality. Keeping your site up-to-date is vital, and so is staying abreast of the latest updates. Adding new media widgets to your site. Experimenting with the improved Text widget. Simplifying your workflow with the new link boundaries. Displaying WordPress events on your dashboard. Do you have any questions about what’s new in WordPress 4.8? Let us know in the comments section below! Article thumbnail image by fatmawati achmad zaenuri / shutterstock.com. I did not believe that the link function could get worse after the last changes. But they managed it with the link boundaries. I wish to have the old function back. One click, one dialog – Link – Alt – Text – New Tab option. That was perfect and effective. The changes may help beginners that set a link here and then. But if you pusblish often a day with many links it is awkward and bad. Agree as well. Having a hard time adding text before and after the “box”. It’s been incredibly frustrating, I’m using the text window so I can edit the code. Thanks John. I always update WP when one is available, but never actually knew what was new. I mostly updated for the security updates that may be included. Thanks again for the useful info. So excited about the media widgets! These are great additions. Will Divi be compatible with new WordPress editor – Gutenberg which is planned in 5.0? This is something we do not know at the moment, but I would certainly think they are fully looking at Gutenberg. Although we have a FREE beta plugin you can try out that will get many updates before version 5.0 of WordPress comes out I am not so sure we even need Gutenberg. I am sorry. I am not following you exactly. What exactly does “I am not so sure we even need Gutenberg” mean? Now if only they’d improve the media library manager so that we can add folders and subfolders and organize things how we want them. So true, Tim. Actually I’m installing WP Media Folder on customer sites to organize their many images and pdfs. But I would really prefer to reduce the amount of plugins on WP sites and media library manager clearly needs a better structure. is Divi compatible with wordpress 4.8? Perfect, I bet WordPress has saved so many bloggers wasted time by adding these features..